I’m getting more good-natured comments about my growing baby bump these days, especially when I’m out and about with my three children (currently ages 6, 4 and 2). “Whoa–you have your hands full, honey.” Yes, I do. You have no idea. “You’re so brave!” Actually, no, I am only here at Costco pregnant with all three kids by myself out of sheer necessity, trust me. I threaten them within an inch of their life before we walk in and then bribe them with pizza and another 3lb container of jelly beans if they’re good. “Girl, you’re on the saint track!” I hope so..may God have mercy on me, a poor sinner! I don’t want to tell people how hard this is. I guess I don’t want to say the truth out loud: that I don’t always do this mothering-many-small-children-thing gracefully. And I don’t even always love it. It’s not so much a pride thing as it’s a complicated thing to talk about being a mother. There are moments of grace and consolation so sweet that they nearly take my breath away. Those are the moments that make me want to share the joys of parenthood with everyone. And those are the moments I cling to when I feel called to be a witness for truth in a culture that views children not as blessings, but more as acquisitions, products, or alternately burdens–even as something like a disease to be avoided or cured. Michael and I were thrilled to conceive and deliver each of our children, and we love them fiercely. Each of them make us laugh every single day, and it’s a special joy to watch them grow up. And yet there are days that I beg God for mercy, because I am failing, failing, failing at keeping my temper in check and my demeanor cheerful and my home a reasonably nice place to be. There are days when I want to be doing anything else but the soul-refining daily work of feeding and cleaning and disciplining and laundering and refereeing and loving my blessings. Sometimes motherhood feels like I’m surviving my blessings. It is a complicated thing to have something as wonderful and irreplaceable as motherhood also be so difficult. There…that starts to scratch the surface a bit, all you kind strangers. Hi Erin! Let me affirm every word of this post! I am a mother of an 8 year old, 4 year old, 20 month old, (one sweet boy loved and held in heaven), and my husband and I are expecting in December. I get every word of this post. I feel it is a holy calling to take on the vocation of motherhood, and I pray every day for the Grace of Mary to delight in the beauty and joy of it all. Our children are such divine blessings and they bring so much joy and laughter into our lives. However, that does not mean that there are hard moments and days and sometimes seasons. I am not always graceful or slow to anger. I love that the journey of motherhood is our journey of faith. I see God’s refinement and sanctification of my soul played out in reel time as I reflect on the virtues (or lack there of) that I am able to model in my everyday mothering. This journey calls us to confession more because we see very real consequences of our lack of self-control, patience, and gentleness in trying times. I return so many thanks for this beautiful lens for understanding my own faults. It calls me to something much higher and greater than myself. Thank you for sharing your story. You are such an evangelist through this blogging medium. Your honest life and witness will call many to the faith. And, I give thanks for you and for your family. Hi Erin! So happy I came upon your blog! And sooo happy I’m not alone or crazy to be feeling these things daily myself. I’m a 29-year old mom of a 3 yr old, and almost 2 yr old, and due next month with my 3rd baby and I definitely struggle with people’s remarks because I LOVE what I do as a mom and love raising my babies, but it gets overwhelming too and I have moments where I feel like I’m really messing up though I wouldn’t trade this for the world. Hard to convey to strangers or parishioners who make those remarks! I just know I don’t ever want to give a negative image of motherhood either since I know the beauty far outweighs everything else…even on those days I’m feeling my 8 months of pregnancy while chasing toddlers! Anyways, thank you so much for writing this honest post! God bless you and your beautiful family! It’s awesome to see thoughts that I’ve had so many times in my head finally written out! And written out so honestly and beautifully. Thank you for your writing Erin. I’m going to need to read this again quite a bit this summer. Striving for more saint than crazy moments! Lovely Erin. I have my pat “Grocery store answers” because, really, there’s too much to say and not enough words to say it all sometimes. Beautifully said Erin. I also feel pressure to make this sanctifying and a sacrificial calling appealing to others. But what peace to know it isn’t about making the job appealing, but rather modeling a willing and joyful heart in the midst of sacrifice. Amen! 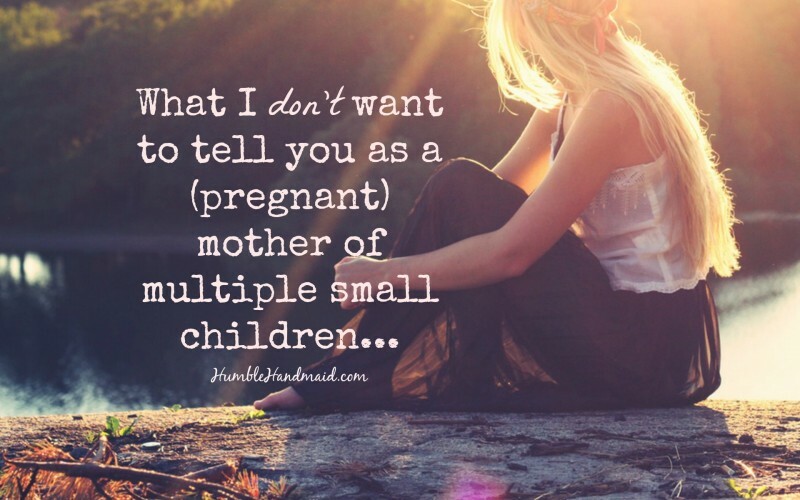 What I find hardest is trying to describe motherhood to my close childless friends who think they may not want kids. My heart weeps for them that they may not want to or get to experience motherhood. But I don’t want to sugarcoat motherhood either- “surviving a blessing” is a great way to describe it! Although I don’t know if it sounds like something anyone wants to do… although isn’t marriage kind of like that too sometimes?! An amazing blessing that in some seasons you just have to hold your breath and hang in there. It’s all worth it in the end. Erin! Thank you so much for this! I needed to read this TODAY! It’s all His timing. This is why I write and have never quite been able to let blogging go. God keeps affirming me in little ways that He wants me to keep sharing and writing. Love and hugs, Miriam! Yes ma’am! 🙂 As soon as we moved into the new house…it was laughable His timing, seriously!!!! Thanks so much, too. We are excited!